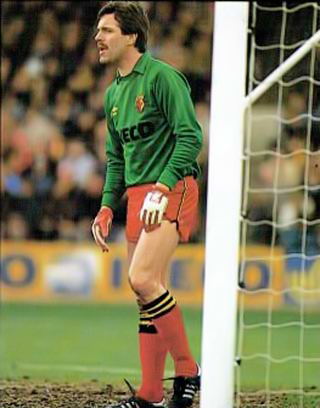 A couple of months before we talked, Eric Steele had helped give former Watford goalkeeper Ben Foster the edge in the Carling Cup final penalty shoot-out against Tottenham. Before the shoot-out Foster, who was playing for Manchester United, watched footage of the Spurs penalty takers on an iPod, which had been given to him by United’s goalkeeping coach. 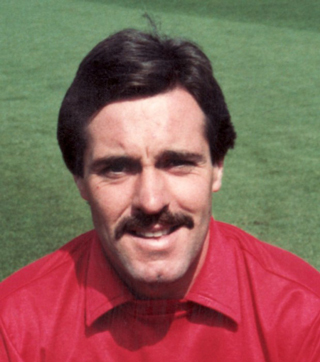 There was a nice Watford connection because Foster had played for the Hornets for two seasons under Aidy Boothroyd and Steele was one of a batch of signings Graham Taylor made shortly after he’d reached the Second Division in 1979. After a season and or so as number one, Steele lost his place to Steve Sherwood and was unable to get it back but he was there as the club rose through the divisions and had some interesting things to say. I called him at United’s training ground one afternoon and started by asking what it was that persuaded him to swap Division One Brighton for the Hornets. The manager [Graham Taylor] and Eddie Plumley did the big sell on me when I first went up there from Brighton. I’d been playing for Brighton in the First Division but he sold the club and the vision to me and persuaded me to drop down to the Second Division. We had the greyhound track round the pitch still. The team was just settling in Division Two and he was struggling at both ends of the pitch a bit. He needed the six million dollar man as the goalkeeper because he was doing a major rebuilding job which I don’t think people really realise. But he wasn’t just building a team, he was trying to create a club that could stay in the Second Division. He had his sights on the top even then but having just got out of the lower divisions he needed people who’d played at a higher level to keep the club in the Second Division. It’s not a huge jump in ability between the two divisions but in the Second Division at that time maybe there was a bit more know-how, more players who had played at the top and were perhaps dropping down towards the end of their careers. I think he needed a bit of that and in quick succession he bought myself, Mick Henderson, Wilf Rostron, Malcolm Poskett, Martin Patching – all experienced people. We were a decent side but I felt it was hard in the league to get that consistency although we had a couple of great cup runs. In my first year we got to the sixth round of the FA Cup – we beat Wolves away 3-0, which was a fantastic result, and played very well against Arsenal at home in the quarter-final, even though we lost 2-1. That Wolves game was a good one because they were First Division and they had Andy Gray up front. I wore all red, crikey me, I looked like a tomato. The next year we had the Southampton 7-1 and we beat Forest 4-1. On our day, we could get up for those games and really perform well and I think that showed the talent was there but it took a while to be able to do it week after week in the league. What did you think of Watford when you arrived? I was quite amazed really. I’d been at Peterborough before and that was a small club but Watford was really like a Fourth Division club still in some ways, although you could see how much work was going on to improve every aspect of the club. We were up at Shendish training. The ground was archaic really but there was a good spirit among everyone. As soon as I trained with the team you sensed something was going to happen and then you saw the young players and realised that a lot of work had gone on behind the scenes that was about to pay off for the club. We had the nucleus of a very good team with those young players coming through. What did you make of Graham? He was very, very single-minded. I have since worked for Graham as a coach [as Aston Villa goalkeeping coach from 2001]. He was still single-minded then and he thought if he was going to be successful he had to do things his way, and if he was going to fail then he’d fail his way. I think that’s something a lot of successful people have in common. At Watford, the group of players who had come from the Fourth to the Second. He was delighted with how they’d done and I think he wanted to give people the chance to show if they could step up to the next level, but I think by the October  he realised he’d need some players with experience of playing at the top level. They’d had a go, but Graham had made the decision that it wasn’t going to work. It was a good decision on Graham’s part. He was loyal to the people who’d done a good job but he recognised he had to turn things around. That is a mark of a man’s ability to make difficult decisions. He was very fond of some of those players who had done so well for him but he had to move them on. He brought in good professionals, not just for their ability but for the way they worked. We became a bit of a cup team but that transferred to the league form over time and I think the Nottingham Forest cup match [in 1980] was a night when a lot of people grew up. We had a good team ethic, a good work ethic. Maybe we didn’t match them individual for individual but as a team if we did everything right, if we worked as a team we could give anyone a game, especially on the home ground. People didn’t want to come and play at Watford then. There was no roof at the top end. The wind used to blow in from the top end. It was a hard place to visit. The slope on the pitch from the Vicarage Road end down to the Rookery made it difficult. In the evenings the atmosphere used to be terrific. I remember against Southampton people were coming into the stadium during extra time. It was incredible. The Southampton game gave us great belief to beat Forest. Interesting you mention the slope – Terry Venables wasn’t too keen on that when he brought his QPR team to Watford. Yeah, but they put the plastic [pitch] in didn’t they. That wasn’t good to play on either. As a goalkeeper you had to be careful with the long kicks from their keeper because the bounce could catch you out. People say there’s no slope at Vicarage Road. Crikey me, you go and play on it. Try kicking up it. Try finding Luther or Ross with a goal kick up that bloody hill with the wind blowing against you. You wanted to be kicking down the slope in the second half, for sure. Some of the club has not changed much since those days. I left there in 1984 and they’ve been telling me since then there’s going to be new dressing rooms. Small, cramped dressing rooms they were. You had the narrow corridor. The away team would arrive and come down those steps. It was intimidating in its own way. I remember the Southampton game they were all queuing to come off. Channon, all of them wanted out of that game once we got to four-nil. The whole thing snowballed. When we got to three, the belief kicked in. They got very nervous and were thinking, ‘We could be in for a real dog fight here.’ You could see one or two of them were not enjoying it. We stopped them playing and it was a totally different game to the one at The Dell. It was one of the most remarkable games I ever played in. After the Forest game, you drew 2-2 against Coventry in round five of the League cup and then you didn’t play in the replay, which was a 5-0 defeat at Highfield Road. Nevertheless, you lost your place to Steve Sherwood then and didn’t get back in. I had played on the Saturday, we beat Notts County. He then left me out for the Coventry replay, which I couldn’t believe. I didn’t agree with his decision but I respected Graham and his decision. I’d always been taught to be professional but I didn’t expect to be out of the team as long as I was. Steve [Sherwood] went on such a terrific run, and it was difficult to see how I was going to get back in. I went to Cardiff on loan, helped them get promoted to the Second Division, played seven games for them. I knew Steve was going to be number one but Graham offered me a new deal. He said he wanted me around because I was a good pro and he wanted me around the club. I was a good pro and I played in the reserves and I tried to help the young lads. I left after the FA Cup final [summer 1984]. I had a great five years but I only played a couple of games in the last two years so I was used to reserve football and I wanted to play in a first team again. I felt I was good enough to play for Watford but the manager went with Steve and, to be fair, for two or three years he was outstanding. Graham used to joke that he’d spent a hundred grand on me to make Steve the ‘keeper he could be and maybe there was an element of truth in that. I went to Derby and we had two promotions and I felt like I had improved as a keeper while I was at Watford, even though I didn’t play much in the last two years. What was it about Steve’s game at that time that was impressive? He had an unbelievable strike out of his hands so he could start attacks from our own penalty box. He had a bit more height. If nothing else, Graham bought me and I helped make Steve Sherwood. Steve was a great lad and I really enjoyed working with him. He was very under-rated by the press, I felt. There were days when he was outstanding in goal and stopped everything. He suited the way Graham wanted to play a bit more than I did, perhaps. He could launch that ball towards the front two. As a goalkeeper what’s your opinion on the second goal in the FA Cup final [Andy Gray’s for Everton]. Even taking into account you were a Watford man? Yes. It was a foul and it should have been given. The thing that annoyed me was it killed the game off for us when we might have been able to press for an equaliser. I felt for Steve that day because that was a high-profile one. Everyone saw it and some people blamed the keeper, some thought it was a foul. For me, it was a foul all day long but as a keeper you get the blame for those ones. It was very unfair. What do you think of when you think back to your time at Watford? I was really happy to be a part of it. Before I came to Watford, I’d been number one. I still hold the record for most consecutive appearances at Peterborough, I played 124 games in a row. I played regularly at Brighton. I was part of a great club during some of the best years they’ve ever had. The best forward I played with was John Barnes. He could do things with the ball that no one could dream of. They got great years out of him. He was a one-off. You could sense from day one he was going to be special. He could play every sport and he was a natural. Elton and Graham left a legacy. Look at how many people who worked under him have gone on to stay in the game. That’s a great indicator of what they did. Graham set standards that have never left me. At the time I thought ‘Crikey me, this is a bit strong’ but it wasn’t. He had young players and he established guidelines and rules and he made them better people as a result. He believed you should look after yourself. You had a duty to the football club. But first and foremost you had a responsibility to yourself. You prepared properly, you came in ready to work, focused. You had a responsibility to the town. When we went abroad we were giving an account of ourselves. I experienced things that I’d maybe not have got to do if I’d not gone to Watford. We went to China on tour. Westernisation was just beginning. We played China twice in Beijing and once in Shanghai. The trip was organised as part of a trade delegation and it was an incredible experience. We saw the old China. We saw it in its raw state. It was amazing. We went to the Great Wall, the palaces and the Forbidden City. There weren’t a lot of TVs in China at the time so the state TV station replayed the games over and over so everyone could see it. Thirty people would gather in hotel receptions or wherever there was a TV to watch the game. The year before we helped New Zealand prepare for the World Cup. It was like, ‘By the way, we’re off for three weeks at the end of a hard season.’ We played in Australia, New Zealand then Malaysia. You find out more about your team-mates in two weeks than in 10 months on a trip like that. We got bored in New Zealand so I ran an ironing competition in the hotel. It sounds really boring but it was absolutely hysterical. ‘Come on lads, let’s see who can iron a shirt.’ Well, chaos. We got the head chambermaid to vote on the shirts. It was frightening. Half of them didn’t have a clue.